Sound issues are not new in Windows operating systems. Almost every new version of Windows brought sound problems to some of its users, and Windows 10 is not different. So, because you can’t normally use your computer without a sound, here’s the solution which might help. How to fix sound issues on PC? 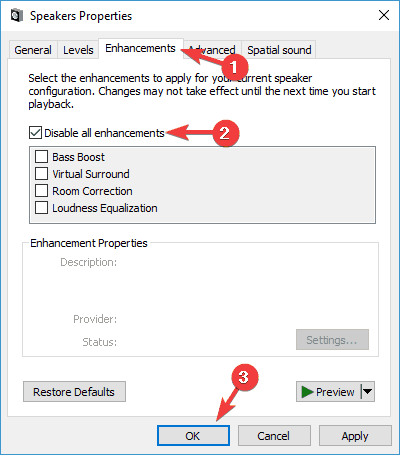 Windows 10 no sound Realtek – This issue can occur with Realtek audio drivers. To fix the problem, make sure that you install the latest drivers and check if that helps. 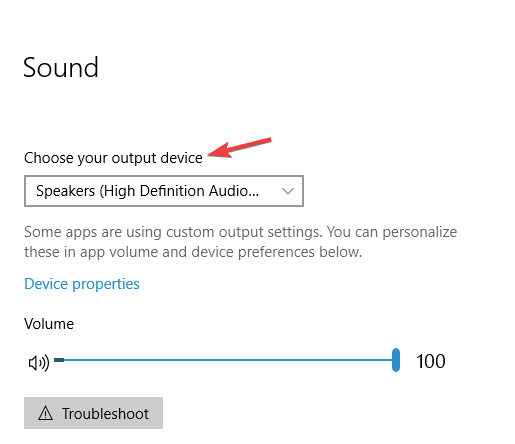 Windows 10 no audio devices are installed – If you’re getting this error message on your PC, the problem might be your drivers. Simply reinstall your driver or try the generic driver and the issue will be resolved. 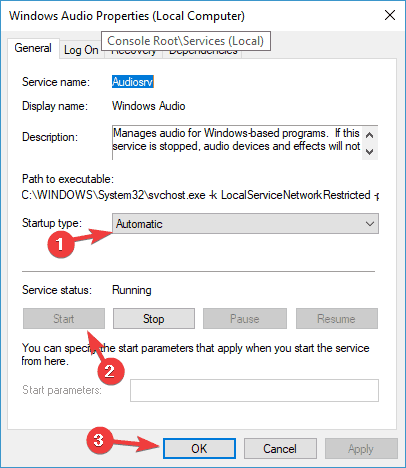 Audio services not responding Windows 10 – If you have no sound, the issue might be related to Windows Audio service. To fix the problem, simply restart the service and check if that solves the issue. 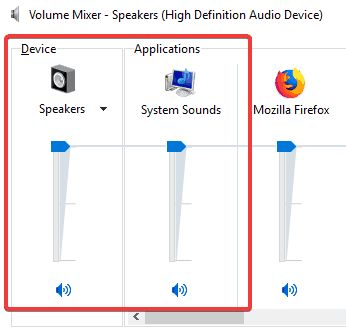 No sound Windows 10 red x, speakers – If you’re getting no sound from your speakers, the issue might be related to volume mixer. 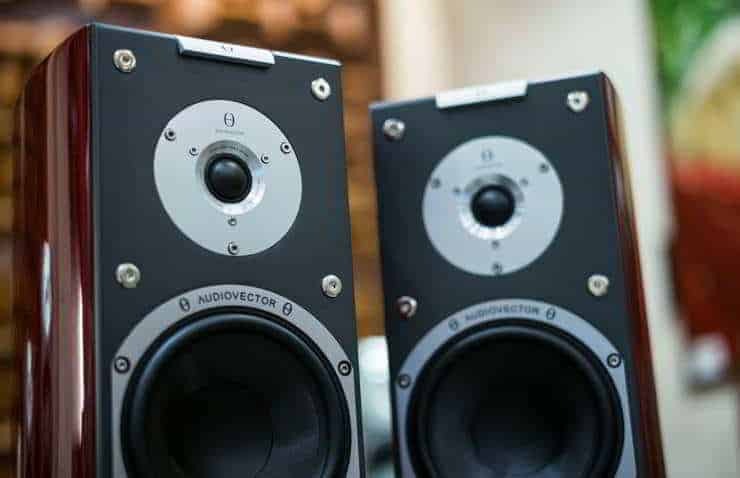 Double check if your speakers are properly connected. In addition, make sure that your speakers aren’t muted in the volume mixer. 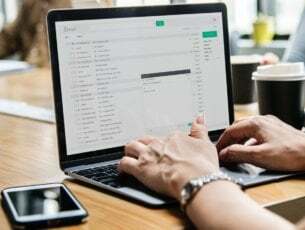 No sound coming from computer, laptop – This issue can affect both desktop and laptop PCs, but if you encounter this problem, you should be able to fix it using one of our solutions. Ever since the Technical Preview, wrong sound format caused audio errors in Windows 10. So, to get your sound back, just change the default sound format. 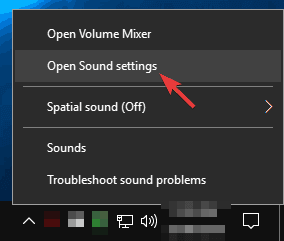 Right-click the sound icon in your Taskbar and choose Open Sound settings from the menu. In Sound section click Device properties. Go to Advanced tab and change a Default sound format to one of the following options: 24bit/44100 Hz or 24bit/192000Hz (depending on your speaker configuration). 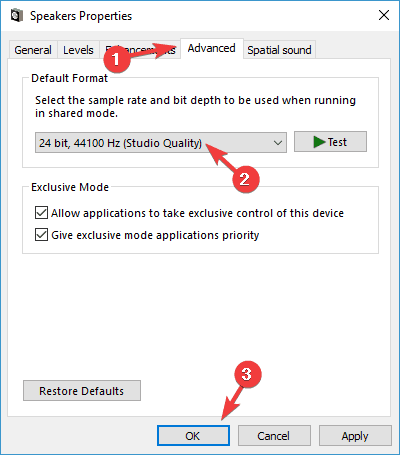 If the issue is still unresolved, you can try the following method and restart the sound drivers. Locate your audio device, right-click it and choose Uninstall device from the menu. Once the driver is uninstalled, click the Scan for hardware changes icon. After doing that, Windows will install the default audio driver and the issue should be resolved. Open Sound settings. We showed you how to do that in Solution 1, so be sure to check it for detailed instructions. When Sound settings window opens, make sure to set Speakers or Headphones as the output device. After making these changes, your default output device will be changed and the issue should be permanently resolved. 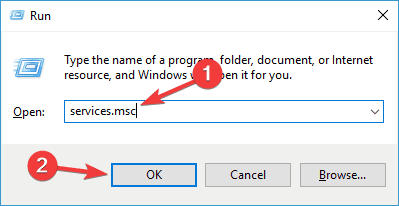 In some cases, you might be able to fix sound problems in Windows 10 simply by switching to the generic driver. Your current driver might not be fully compatible with Windows 10, and that can lead to various sound issues. Locate your audio device, right-click it and choose Update driver from the menu. 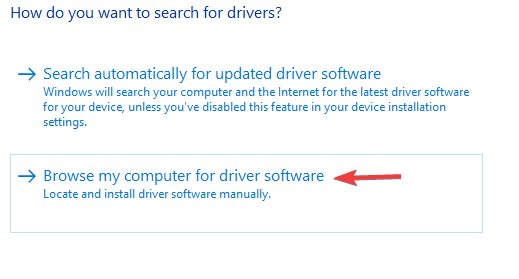 Now select Let me pick from a list of available drivers on my computer. 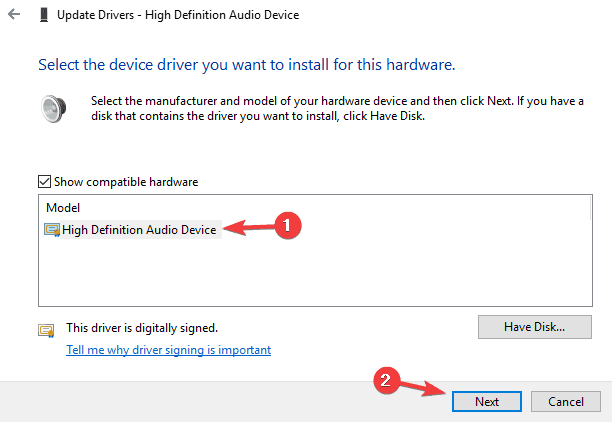 Select High Definition Audio Device driver from the list and click Next. Once you install the default driver, check if the sound problem is resolved. 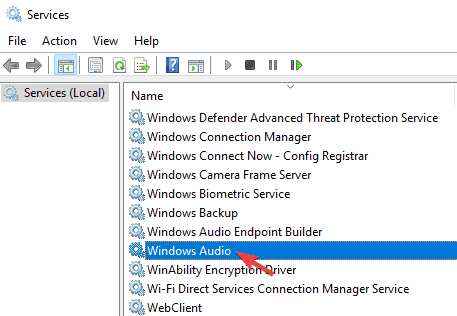 When Services window opens, locate Windows Audio and double-click it to open its properties. Set the Startup type to Automatic and click the Start button to start the service. Now click Apply and OK to save changes. If the service is already running and it’s set to Automatic startup type, you just need to restart it to fix the problem. 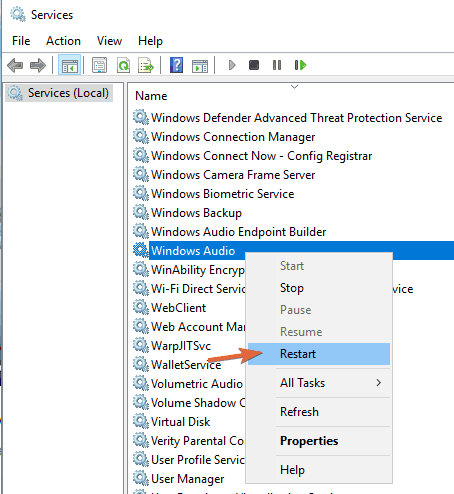 To do that, locate Windows Audio service, right-click it and choose Restart from the menu. Follow Steps 1 and 2 from Solution 1. When Speaker Properties window opens, go to Enhancements tab. Now check Disable all enhancements option. Click Apply and OK to save changes. Once you disable the enhancements, the issue should be completely resolved and the sound will start working again. According to users, sometimes sound problems can occur due to outdated drivers. In some cases, the generic driver can’t fix the problem, and your only option is to download and install the latest drivers. To install the latest audio driver, you need to visit your motherboard’s or sound card’s manufacturer’s website and download the latest audio driver. Before you can download the appropriate driver, you need to know the model of your motherboard or sound card, so be sure to check that. If you can’t download the necessary audio driver, you should consider using a third-party solution. There are tools, such as TweakBit Driver Updater, that can automatically download all the missing drivers for you. If you don’t want to manually search for the missing drivers, be sure to try this tool. If you’re getting no sound on Windows 10, the issue might be your cable. To diagnose the problem, check if your speakers are properly connected. Sometimes you might connect your speakers to the wrong port on your PC, and that can lead to this and many other problems. If your speakers are connected to the right port, be sure to inspect the cable for damage. Lastly, check the power supply cable and be sure that it’s properly connected. 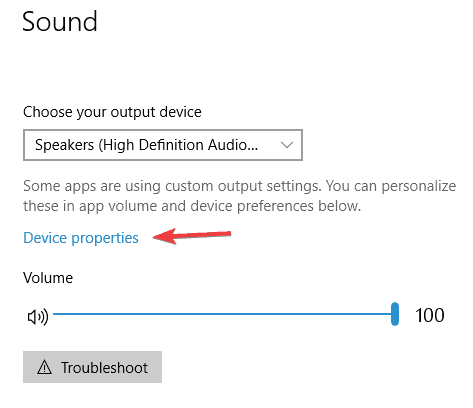 Sometimes if you’re getting no sound on your Windows 10 PC, the issue might be volume control. In some instances, your speakers might be muted and that can lead to this and many other problems. 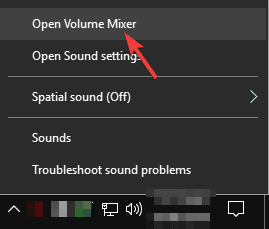 Right-click the speaker icon in your Taskbar and choose Open Volume Mixer from the menu. Now make sure that Speakers and System Sound channels are turned all the way up. In addition, if you have another software for volume control, you should also check and see if the volume control is properly configured. Certain drivers will install their own volume control software, so be sure to check it out. That’s it, I hope these solutions helped you to get your sound in Windows 10 back. If you have any other Windows 10-related issues you can check for the solution in our Windows 10 Fix section.